The Fern and Mossery: Which to Use: Craft Moss or Living Moss? Which to Use: Craft Moss or Living Moss? Craft moss above, real moss below. Moss is a central supply for many popular gardening crafts, including terrariums, fairy gardens, kokedama and more. When do you need to use living moss for your craft and when will craft moss work? The simple answer is: use living moss in projects with real soil and real plants, keep craft moss for "dry" projects, such as a short-term terrarium, a project with fake plants, or no soil. Living moss is green and vibrant, with fibrous roots visible when you pull apart the pieces of moss. You might find living moss in your yard, the forest or at a garden supplier. You may choose to wash your moss of critters and rocks if you harvest it from your yard. Use living moss alongside other living plants, in displays you want to last and grow. Examples are fairy gardens and terrariums with living plants. Note that living moss will not thrive in a succulent terrarium with sandy soil. Moss prefers richer soil and humid conditions. Craft moss is also known as preserved moss, reindeer moss, and any other dried thing that you might find in a plastic bag at a craft store. It has a brittle touch like a dried sponge, and may have artificial green color applied. It also sometimes appears in fluffy, cloud shaped tufts. Craft moss will not revive with water and soil, but is more likely to become musty and rotten over time. Craft moss is excellent for "one time use" terrarium projects, like wedding centerpieces or displays. Craft moss may also be used in a faux terrarium that contains artificial plants or no soil. Sphagnum moss is a garden supply product, formed of the long fibrous strands of plant material. It is often used or to line hanging wire baskets, or kokedama balls. I also recommend using sphagnum moss to form a filter layer between your terrarium soil layer and gravel layer, to prevent soil mixing down into the bottom of your terrarium. Sphagnum moss is not to be confused with peat moss, the short fibered, acidic mulch used as soil amendment in container gardening. Read more about identifying the difference between real moss and craft moss at the Miniature Gardener. 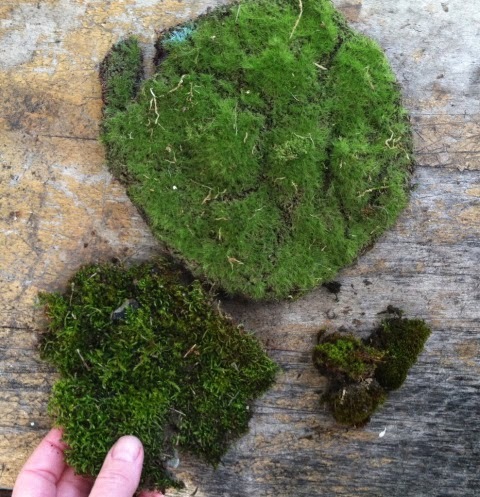 I'm going to attempt my first moss bath rug this weekend. My question is what's the best way to "glue" my moss to the foam bottom? I will be foraging for moss in the woods.